Colleen Rooney, class of 2011 at Regis High School, recently verbally committed to Santa Clara University. She received a write up by ESPN...she has been a Next Level student since August of 2009.
click on the link below or scroll down to read...CONGRATS Colleen! Glenn Nelson/ESPN.com High-scoring guard Alisha Gray was one of the top young players at the Music City Madness tournament. Joey Bailey, Cy-Fair Nike-Hensle: The Cy-Fair program entered two teams in this year's tournament and both were strong contenders for the title. One of the top contributors of the Cy-Fair-Hensle edition was combo-forward Joey Bailey. It would be easy to assume that due to her size at 6 feet 3 and solid frame that she is strictly an inside player, but those assumptions would not be justified. Her ability to play on the perimeter gives her team a decisive height advantage. Her perimeter shot is consistent and she has a nice bank shot that she executes from 12-15 feet. Her height makes her a threat from the wing, as she is not a fleet of foot athlete, who can drive past any solid defender. A position or area rebounder, Bailey will need to produce more in this area to be considered among the elite. The Gunter, Texas, native has a solid all-around game and showed that throughout the tournament. Sharlay Burris, Arkansas Lady Hawks A point forward, from Parkview High School, Burris is said to be working her way back into form following a ACL injury she sustained following her sophomore year. If her play at the Music City Madness is any indication of her progress we would say to everyone "she's back." Burris' one-on-one skills are extraordinary considering her 6-foot height and ability to make plays for her teammates with her passing. She sees over most backcourt defenders and uses her ability to penetrate to draw the help-side defenders. Once the help side "D" has been baited into stopping the drive, Burris delivers the pinpoint pass to open teammates. While she has perfected this facet of her game, her shot selection and attention to defensive details still lag. We like her size and ability to run the team from the forward spot -- a feat not mastered by many. Shanice Cason, Tennessee Flight Silver Tennessee Flight Silver entered the tournament as winners of two elite showcase tournaments in July -- Premier 64 (Frisco, Texas) and Battle on the Boro (Murfreesboro, Tenn.). 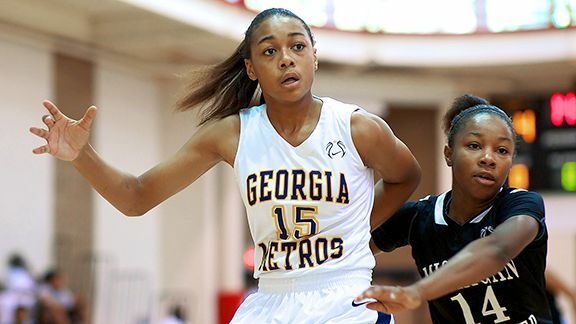 Those feats were accomplished without starting point guard Ariel Massengale, who had been leading Team USA 17U to a Gold medal finish of her own. Luckily for the Flight Silver faithful, their backup point guard was of high caliber. Cason is a stoutly built lead guard who is as fearless as they come and a top-level competitor. She is a dual threat at the position -- a scoring point guard capable from scoring anywhere on the floor, and also a strong and fast floor general who can manage the collection of ultra-talented players that make up the Flight Silver. A single-handed press breaker herself, Cason will make you pay for anything resembling full-court pressure. She weaves in and out of traps like a speedway car and delivers a nice midrange pull-up just for good measure. Defensively, she hawks the ball with the best of them and is also willing to take a charge or two as we witnessed during one viewing. She has to do a much better job in the turnover department as unforced errors are her signature weakness -- a weakness that can be corrected with more focus. Kristi Mokube, Georgia Blazers Red Despite only a limited viewing of Mokube, we liked what we saw in the post. Possessing great size and athletic ability, she had several multiple rebound possessions during the final day consolation contest. She is one of those rare athletes who can move laterally and vertically and cover a substantial amount of court. Her long arms only add to her ability to rebound from any starting position. Although her ability to finish shots on the offensive end has yet to develop, you know that her willingness to work and overall raw athletic ability will someday ensure that she will be a focal point of her team's offensive game plan. She sprints the court with the guards in the up-tempo game. Her potential is of great interest and this prospect's future looks brighter than her present. Apiew Ojulu, Minnesota Stars 16U Borowicz In an era (and senior class), where back-to-the-basket post play seems to not exist, the Stars' Ojulu has made this the style of play she is willing to deliver. Physical and tough, the 6-3 post plays with the understanding of the closer to the goal she is, the higher the percentages. She sprints down the middle of the floor in textbook fashion, not seeking delivery of the pass until she is in full post position with the defender on her backside. If the pass is not delivered she is willing to re-post and create different passing angles looking for ball reversal and another opportunity to seal for delivery. Once the pass is delivered, Ojula has a good touch around the basket and scores with either hand. Colleen Rooney, Mile Hi Magic Gold It has been a pleasure for years to watch a Carl Mattei coached ball club. They always seem to compete at the highest level and demonstrate coerciveness that few club teams present. This year's version was no different led by the play of Rooney, a deluxe combo-forward with a splendid offensive game. A big-time transition finisher, she can also cause major problems inside with her size. She delivers a high arching 3-point shot and is an outstanding rebounder from the wing.